Sweet River Abattoir & Supplies Company Limited (SRA) for the nine months ended December 31, 2017, recorded a 7% decline in revenue to $239.43 million relative to $257.10 million in the same period in 2016. Revenue for the quarter declined 6% to close at $73.98 million relative to $78.87 million. Cost of sales fell 13% from $223.36 million in 2016 to $195.35 million in 2017. As a result, gross profit increased to $44.08 million, a 31%% increase when compared to $33.74 million for the same period of 2016. Gross profit for the quarter worsened 15% to $11.83 million compared to $13.97 million reported for the third quarter ended December 31, 2016. Administrative expenses reflected an increase of 40% from $24.51 million for the nine months of 2016 to $34.38 million in the corresponding period of 2017. Consequently, SRA recorded operating profit for the period of $9.70 million relative to $9.23 million booked for the prior year. Finance costs closed the period at $13.87 million, an increase of 69% when compared to $8.19 million for the corresponding period last year. 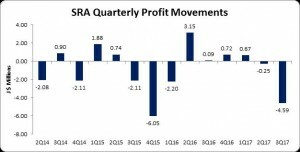 As a result, SRA recorded a net loss of $4.17 million for the nine months ended December 31, 2017 relative to a profit of $1.04 million in 2016. The company booked a loss for the quarter of $4.59 million relative to $89,000 for the comparable quarter in 2016. The loss per share for the quarter amounted to $0.056 versus earnings per share (EPS) of $0.011 for the corresponding period last year. the loss per share for the nine months amounted to $$0.051 compared to $0.013 booked for the comparable period of 2016. The twelve months trailing loss per share is $.0423. As at February SRA price was trading at $3.80. The number of shares used in this calculation was 81,531,043 units. As at December 31, 2017, SRA recorded total assets of $444.17 million (2016: $435.93 million), a 2% increase year over year. ‘Trade and other receivables’ and ‘cash and cash equivalents’ were responsible for the overall increases due to a 129% and 1017% growth year over year. ‘Trade and other receivables’ and ‘cash and cash equivalents’ as at December 31, 2017 amounted to $$18.27 million (2016: $7.99 million)) and $11.99 million (2016: $1.07 million). Total stockholders’ equity as at December 31, 2017 closed at $158.14 million, down 2% from $161.96 million last year. This resulted in a book value of $1.94 compared to a 2016 value of $1.99 a year earlier.